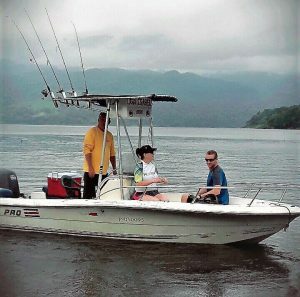 Fish for Rainbow Bass (Guapote), Machaca and Mojarra on Lake Arenal at the base of the Arenal Volcano on a 19ft Sea Pro center console powered by a 95HP four-stroke Yamaha outboard. Experienced Captain Marc Delvaux has been a guide on the lake for 25 years. The boat is fully equipped with a broad range of quality bait and spinning tackle, and top lures; live well; electronics, GPS, and marine radio; and bass seats, life vests and safety gear. All equipment, fresh sandwiches, fruit, snacks, beverages and beer (coffee on request) are included. The boat can take a third and fourth angler at an additional cost, but only two can fish at the same time.